Welcome to Garden Bloggers' Bloom Day for September 2015. Here in my USDA Hardiness Zone 6a garden in central Indiana, a visitor might think I had some mixed up flowers if they came by and saw the Colchicums and Autumn Crocus in bloom this week. But this is the season for these fall blooming beauties. I rather enjoy them, now that I have them in my garden. They and their spring blooming relatives are like bookends with the entire growing season of my garden in between. 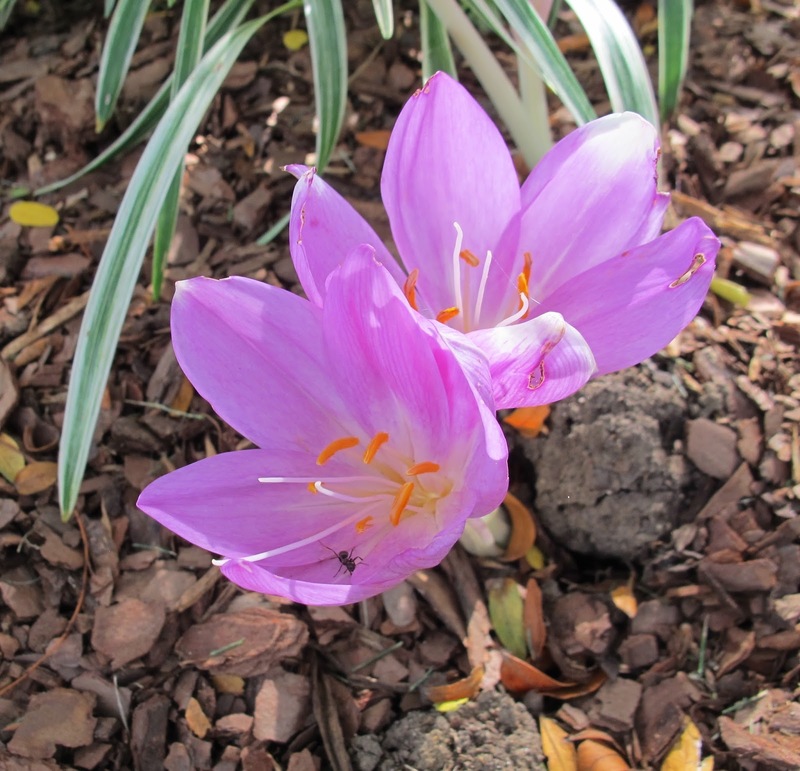 Several of the Colchicums blooming in my garden now were sent to my by Kathy at Cold Climate Gardening. She is quite the evangelist when it comes to spreading the word about fall blooming bulbs like these. Nearby, the variegated Liriope grass, Liriope muscari 'Variegata', which is not a grass at all, is blooming with its lovely purple blooms. I like how the two look together, the Liriope and the Colchicums, but of course, I didn't have the sense to provide a picture of them together. Soon these blooms will wash out and the New England asters, Symphyotrichum novae-angliae, will provide all the purple I need and then some. Another spot of purple in my garden comes from the Hyacinth bean, Lablab purpureus. Even the pods are purple. And isn't Lablab a fun botanical name? And did you know purpureus is the only species in the genus Lablab? "Dear Plant Taxonomists, Please don't take away the genus name Lablab, like you took away Aster and replaced it with Symphyotrichum." Speaking of changed botanical names, how about tall sedum? It was once Sedum telephium and now it appears to be Hylotelephium telephium. I have two colors blooming side by side right now. Yum. I love these easy to grow, never fail, early fall bloomers. And they turn the loveliest brownish-rusty color later in the season. You should see them with little tufts of snow on them. But let's not think about that quite yet. What else is blooming? Short's goldenrod, Solidago shortii 'Solar Cascade', is blooming. That's what else. This is a great goldenrod, nearly lost to us forever until it was found by horticulturists from the Cincinnati Zoo who helped to propagate it and get it out in the nursery trade, making it available to gardeners everywhere. Get it. You will love it. Next year I hope to also have Barnardia japonica blooming in my garden, just like it blooms in Elizabeth Lawrence's garden in Charlotte, North Carolina. I took this picture of Barnardia in Elizabeth Lawrence's garden about 10 days ago when I visited it for a second time. The wonderful Andrea, who tends the garden now, gave me a little pot of it to take home. It is definitely hardy enough for my garden, as we both figured out by looking it up on our iPhones. I imagine if Elizabeth had been alive, she would have run inside to her study and looked it up in one of her hundreds of books to verify its hardiness. While I was visiting the garden, Andrea showed me some of the journals Elizabeth kept to record when flowers bloomed in her garden. Oh, look, here's one turned to September. If you are Andrea and have been studying many of Elizabeth's handwritten notes for several years, you will see that on September 15th, Lycoris albiflora was blooming. The rest of us will have to take her word for it. And the same Lycoris was blooming while I was there. It appears to be marginally hardy for me, but may be worth a try. And that's bloom day for me with a wonderful little side trip to Elizabeth Lawrence's garden. What's blooming in your garden as we move too rapidly toward the end of the growing season here in the Northern hemisphere? We would love to have you join in for Garden Bloggers' Bloom Day and show us. It's easy to participate. Just post on your blog about what's blooming in your garden on or about the 15th of the month, then leave a link to your bloom day post in the Mr. Linky widget below and a comment to tell us what you have for us to see. You have so many wonderful blooms for this time of year Carol and you have me thinking about getting some of those fall crocus. Thanks for hosting as always and Happy Bloom Day! Happy Bloom Day, Carol. Your garden, as always, is beautiful. Thank you SO much for hosting this every month! It's such a treat to see all these gardens so different from my own, and such an inspiration! It's great that Elizabeth Lawrence's garden and notes were preserved. We could wonder as gardeners what of our creations would outlast us. I managed to get some Solidago shortii Solar Cascade, and another 2 out of the 6 goldenrods I ordered survived, Fireworks and Golden Fleece. They are slowly building more rhizomes and stems, so I hope they will one day be nice clumps. The Barnardia I had not heard of, a fall-blooming bulb is rather a rarity. Sedums have been one of those hard to kill dependable fall flowers for me, too. To me it is a travesty what the botanists have done to the Sedum and Aster names. I saw a patch of Colchicum the other day and realised that every year I fail to plant any here. They are lovely things - as are all the plants you have shared from your garden in this post. 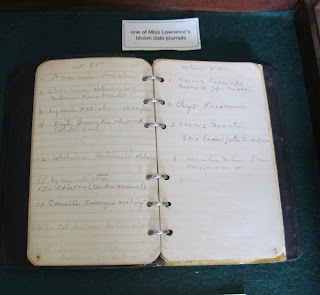 How interesting that the tall Sedum has been renamed - somehow I missed that - and what a treat to see that notebook! Hi Carol. The sedums are just beginning here. Once they get going there is no way I can deny autumn any longer! Thanks for hosting Bloom Day. It is so nice to be able to visit everyones' gardens. Thanks. I feel your frustration on all the name changes, as I can spell Lablab and Sedum, but have to look up many other names. Happy GBBD, and thanks for hosting. Thanks very much for hosting Carol. This is a wonderful time of year isn't it? I have enjoyed reading your post today and joining in with your September Bloom Day. Happy gardening! I must go and see if my colchicums are flowering, they are such lovely flowers aren't they! You have so many unusual flowers in your post this month, they're beautiful. Thanks for hosting once more. Your garden is beautiful as it steps into fall. Mine is still mired in summer but with the arrival of rain this morning (early in the season for us!) I'm hopeful that it's going to be a very nice fall. Thanks for hosting Bloom Day Carol! Your colchicums are beautiful. I finally ordered some for delivery this fall. I just love colchicums; need to find some good spots for them in the garden here that will ensure the pricy investment ends up being worth it. As always, thanks for hosting! Sedums, goldenrod, and asters blooming in my garden. I'm with you on the Lablab - that is such a funny name. I too hope they don't change that for some tongue wrestler. Enjoy all your pretty fall color! Colchicum are favorites of mine too. Well except during that time when the foliage is ripening and looking sickly but this time of the year they're gorgeous! How cool that you've visited the Lawrence garden and even brought home plants! Your garden is looking quite floriferous. Lablab purpureus...thanks for the introduction! I am finally getting around to participating in GBBD. I love the autumn crocus and need to get on that for my own garden. Beautiful blooms but most importantly, best of luck to your Pacers, the season is near! Hmm, I'm zone 7 and my Autumn Crocus are way behind yours. That may be because of our summer drought or maybe critters got to them. Will keep an eye out for them. Keep up the great Bloom Day work! Your flowers are looking fantastic ! So much colour! Mr Linky does not love me - I have tried to paste my link several times but he won't hear of it ! Hope it is ok to put it below instead ! Happy bloom day; fall, to me, is always a bittersweet time. Lovely weather but it signals the near end of the growing season. I've thought about fall crocuses. Haven't quite decided if I want to try them. Love seeing everyone's blooms. I still have lantana, zinnias, marigolds, geraniums and a few petunias going strong. There is an obvious chill in the air, though, so the feeling of sadness/impending fall and winter is hard to avoid. I'm saving seeds like mad trying to stave off those winter blues! We are quite familiar with the Elizabeth Lawrence garden. The previous owner is a friend and fellow member of the Charlotte Garden Club. I'm glad you were able to visit that beautiful garden...it is indeed a treasure for us here in the Charlotte area. I hope the next time you are here, you will be in touch and perhaps have time to see my garden. You would be most welcome. Hey Carol, Happy Bloom Day! I’m so excited to be linking up this month :) I absolutely love your Hyacinth bean & Tall sedum. I definitely want to plant some more fall blooming plants in my garden and sedum is at the top of my list! I really enjoy getting inspiration from everyones gardens. Thank you so much for hosting and have a great September. Nice Lycoris. I'm still working on getting some Nekkid Ladies in the garden. I'm reading El's 'Gardening for Love' . She was wonderful. I day dream about having her as my neighbor! Sedums and colchicums are there to cheer us in the tail end of the year. I 'be managed to keep a splash of sunshine in the garden, but it'll soon be over. Love the liriope -that might be one for my list next year. Thank you very much for hosting this event! You have a beautiful garden! You've alerted me of two name changes I was unaware off - will they ever stop! Your garden is looking great right now and at a similar stage to mine here in Scotland. Thanks for hosting. Seeing your hyacinth bean vine makes me regret that I never got any planted this year. Lablab--what a fun botanical name! How cool that you got to visit Elizabeth Lawrence's garden again. Happy September, Carol! Than you for hosting again! Happy Bloom Day! Colchicums are beautiful. I've been noticing a surprising number of them, at least in one neighborhood near home. I have yet to add any to my garden. Must rectify that. At this point I'm wondering how long it will be before I begin making Garden Blogger Bloom Day comments a month after the specified day. I keep falling further behind. I do have the excuse of being on travel when it transpired. I liked seeing the Bernardia as I grew that one from seed this year for the first time. I have it in a pot and hadn't imagined trying to put it outside but now I may experiment. I love your crocus and liriope. I have to take notes on what is blooming in everyone else's yards this month. I certainly don't have much in mine. How fun that you got to peek at a Bloom Day journal. Thank you for the link love. Anyone interested in learning more about colchicums can read about them here. Your asters bloom after your colchicums, but mine bloom at the same time, a function of my shorter growing season, I'm sure.